The new Democratic majority in the House of Representatives can’t force President Donald Trump to abandon his efforts to crack down on asylum-seekers, migrant families and immigrants already living in the U.S. But it can make it harder for him to enact his agenda. Whether through oversight, withholding funds or passing pro-immigrant bills and daring the Republican-controlled Senate and the president to shoot them down, Democrats now have leverage on immigration. Republicans, of course, will still control the Senate after Tuesday’s midterms, and Trump will still be in the White House, where he has already cracked down on undocumented immigrants without congressional help. Still, there were glimmers of hope around the country. Oregon voters rejected a ballot measure that would have ended the state’s “sanctuary” policies. Kansas gubernatorial candidate Kris Kobach, a Republican who has spent years pushing hard-line immigration policies around the country, lost. So did Pennsylvania U.S. Senate candidate Lou Barletta, who enacted an anti-immigrant policy years before as a mayor and recently defended separating families at the border. Several other Republicans who campaigned on immigration crackdowns lost too, which immigrant rights advocates held up as proof that Trump’s fear-based campaigning wasn’t the guaranteed winner he seemed to think it was. And now that Democrats have taken control of the House, they can serve as a check on Trump’s immigration efforts. Democrats are expected to launch investigations and conduct oversight on a number of Trump actions and policies ― something Republicans have so far declined to do. And immigrant rights groups will be pressing them to do so. Tyler Moran, managing director of progressive group The Immigration Hub and a former Senate and White House staffer, pointed out several areas ripe for oversight. Those include the Trump administration’s family separations at the border, its deportation tactics, and its decision to end the Deferred Action for Childhood Arrivals program for young undocumented immigrants and temporary protected status for certain nationalities of immigrants whose home countries suffered natural disasters or violence. Many of Trump’s immigration policies also require significant funding increases ― something a Democratic House is likely to fight. The Democrats have already vowed not to fund Trump’s wall along the southern border. Trump is expected to push for wall funding during the lame duck session while Republicans maintain control of both chambers, and has suggested a government shutdown in December if he doesn’t get what he wants. 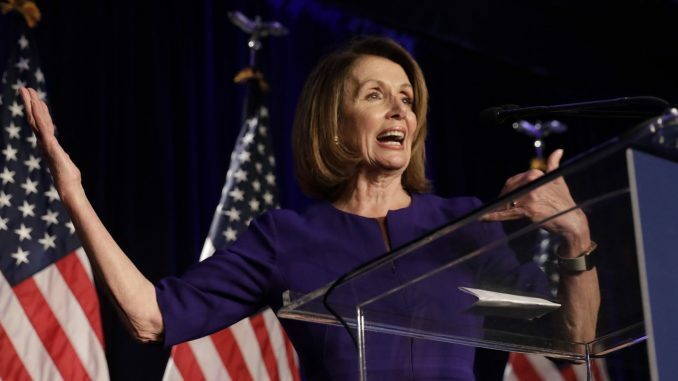 House Minority Leader Nancy Pelosi (D-Calif.) told The Wall Street Journal ahead of the election that if Democrats should win a majority on Tuesday, they’d have more leverage to block wall spending even before they officially take over. “Why would we compromise on the wall now?” she said. Mass detention of families and asylum-seekers, which Trump is pushing for through a proposed rule change and a potential executive order, would also have a hefty price tag. Most Democrats oppose such policies. Democrats are also likely to push legislation that protects undocumented immigrants, particularly young immigrants, which could increase public pressure for Senate Republicans and Trump to back it. Trump ended the Deferred Action for Childhood Arrivals program, or DACA, last year, but so far has been forced to keep it running by court orders that he is continuing to fight. Although Republicans opposed DACA, some have voiced support for some type of legislative measure that would keep its recipients ― so-called Dreamers who have lived in the U.S. since childhood ― from being deported. But so far, Republicans haven’t actually supported measures that would do so, at least without simultaneously aiming to restrict legal immigration and ramp up deportation efforts. Immigrant rights groups want a “clean” bill for Dreamers, called the Dream Act, that doesn’t include other measures. Democrats are expected to push for it, but past stalemates are likely to continue. More likely, Democrats could make a deal to protect Dreamers while also giving Trump something he wants, but not the whole spate of anti-immigrant measures Republicans tried, and failed, to pass earlier this year. While Democrats gaining the majority was a good thing for supporters of immigrant rights, it required knocking out some moderate Republicans who could previously be claimed as allies on bipartisan legislation. Rep. Carlos Curbelo (R-Fla.), who unsuccessfully pushed for protections for undocumented young people, lost to a Democrat. So did Rep. Mike Coffman (R-Colo.), another Republican who called for legal status for Dreamers, although he spoke in more hawkish terms at an August fundraiser. The defeat of bipartisan backers may be more of a symbolic loss than a substantive one. The Democrats who will take their place are likely to be even more reliable supporters of immigration reform. Leading immigrant rights advocates, including Frank Sharry of America’s Voice, cheered Coffman’s defeat.